The 1963 Corvette chassis assembly continues out here at the shop. 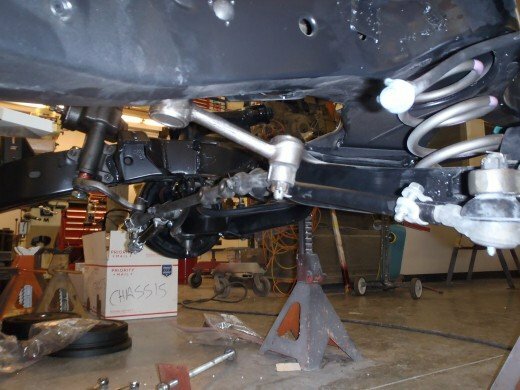 We have finished up assembling the front suspension and have moved on to installing brake lines, hoses, and steering. 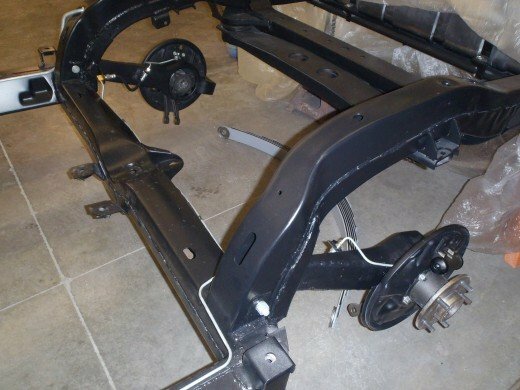 This is a great accomplishment as now the Corvette chassis begins to look like and actual chassis instead of a bare frame. 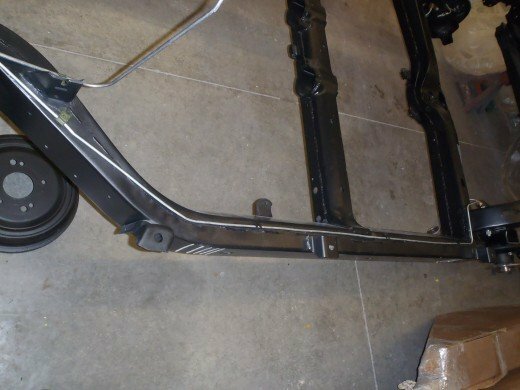 We installed the sway bar on the front of the chassis. 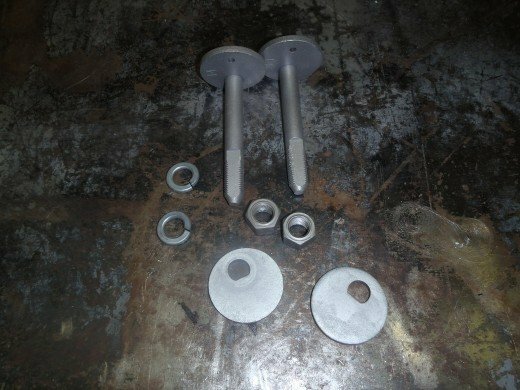 Unfortunately our Corvette did not come with a original idler arm, so we purchased a reproduction to use until we locate an original. 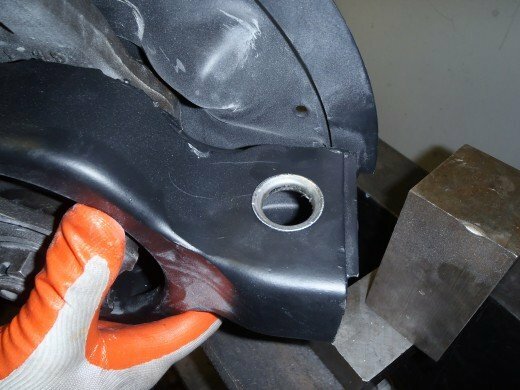 The reproduction came with a zinced mount which is incorrect so we stripped the zinc off to bring it back to as cast look. 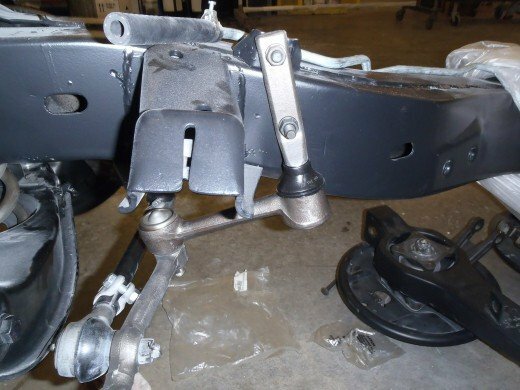 Here is the idler arm installed on the chassis. 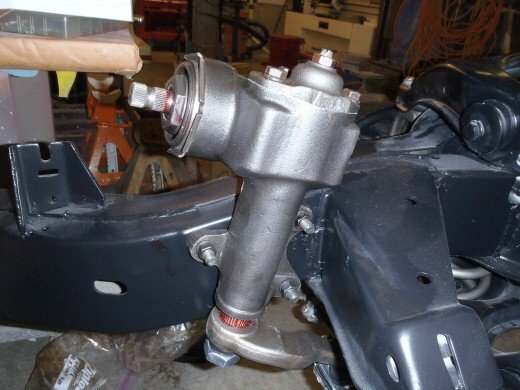 We fully rebuilt the steering box for the Corvette and refinished it in bare steel. These could be either painted black or bare steel. Being that most people paint every part they can, we chose to refinish it in bare steel to set our car apart. The relay rod and tie rods all installed. This means our chassis now has steering and is halfway to being a rolling chassis. We installed our brake lines and clips. The brake line running to the rear of the vehicle. Next up we wanted to get the trailing arms installed so we could finish up installing our brake lines. 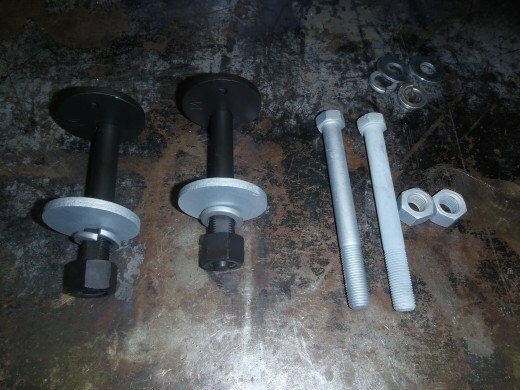 Here we have the original trailing arm pivot bolts and the strut rod adjuster bolt/cams. Here is a quick note on the 63 Corvette chassis. 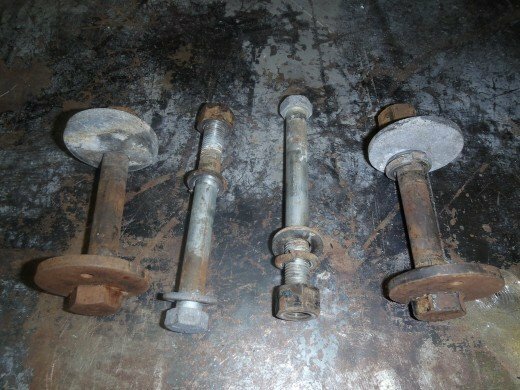 On the 63 chassis for approximately the first 16,500 cars the trailing arms were installed with bolts, flat washer, lock washer and nut – as seen on the center bolts above. 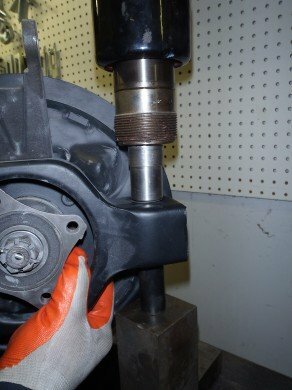 After this VIN, they switch to a bolt with two flat washers and a castle nut with cotter pin. If you refer to the GM assembly manual, you will notice that the drawing is of the later castle nut style setup and doesn’t show the original setup. You’ll also not that the GM drawing was noted as being redrawn and revised in the foot notes. If you get a reproduction set of hardware, it will likely be the castle nut setup. The key here is to keep your original hardware and restore it, or you will be out of luck. This is twice that we have found the bolts to be 7/16 fine thread with a “M” head-mark. 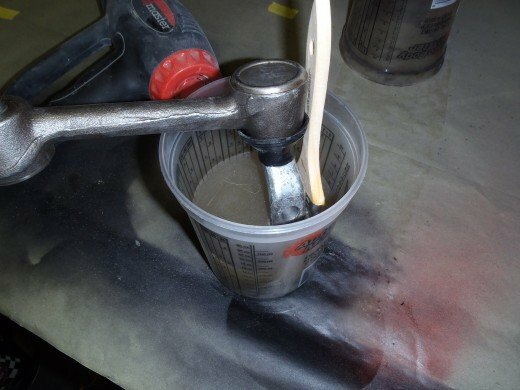 To refinish the hardware we blast it to remove all rust, then soak it in sulfuric acid to remove any old zinc. We then refinish it in either black oxide or zinc depending on what it was originally. Notice the strut adjuster bolts are black oxide while the washer cam is zinc. If you order the reproduction of this it will likely come as all zinc. Look back at the earlier photo to see what it was originally. 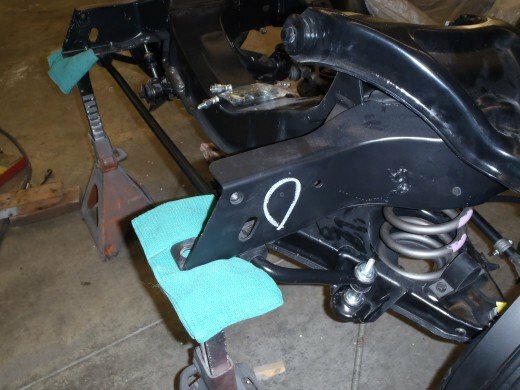 Next up we needed to install the bushing cups in the rear leaf spring and trailing arms. To flare the cup we made a nice little flaring tool to use with our press. 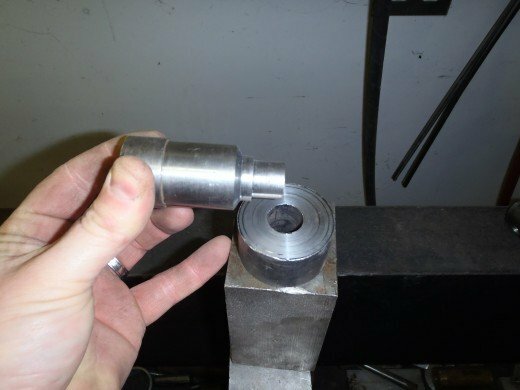 Here you can see the center pin aligns the tool while pressing and we machined in a shoulder to prevent over flaring. 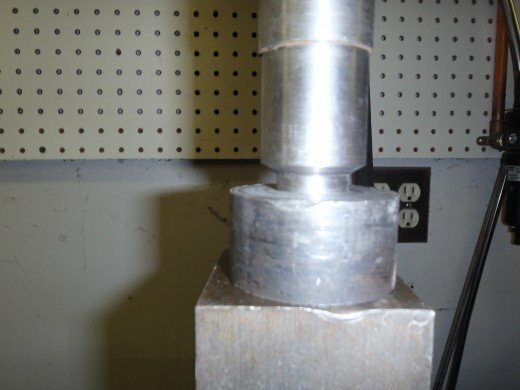 The tool does a great job of flaring the bushing cups. 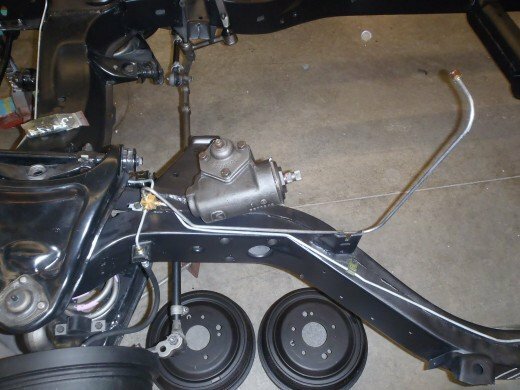 Here the trailing arms have been installed on the chassis and the brake lines have all been hooked up. Next up we’ll get our rebuilt differential installed so we can fully assemble the rear suspension.